It all begins with an odd encounter at night in a park. 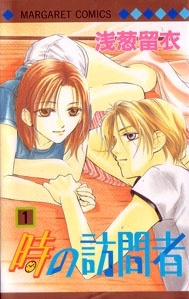 Touko-chan is walking home from a convenience store when she comes across a handsome guy who looks a bit strange. What he says when he sees her is even more strange. He asks her wat month, day, and year it is! Touko things this guy is really weird, but she answers his question and goes along her way. The very next day she encounters that strange guy again. This time he is a new transfer student in her class! His name is KAIBARA Jin, and he acts as if he has no memory of meeting Touko at all. Jin is very cute, and all the girls in Touko’s class like him a lot. Touko, however, still thinks he is odd, and she can feel him looking at her sometimes, though she has a hard time catching him at it. But she doesn’t have much time to dwell on the new student. Touko is busy trying to deal with some awful school bullying. After accusing her of stealing someone’s boyfriend (something she didn’t do) all the girls in her class have been playing mean tricks on Touko. It’s the usual Japanese school bullying — Scrawling unpleasant remarks in her class notebooks, putting needles and thumbtacks in her indoor school shoes, ignoring her, that sort of thing. Touko quietly puts up with it all, and really only manages to cope thanks to the loyal friendship of her friend Miyuki. Miyuki is the only one who ignores all the bullying and remains friends with Touko. Enduring the cruelty is a pain, and Touko can sometimes sense that Jin is observing her and knows what is going on. He too, doesn’t seem to mind being friendly to Touko in spite of her outcast status. Jin is very mysterious, and has a sort of unusual aura around him, like Touko can sense something different. However, because Jin is cute and pupular, his attention and friendliness towards Touko only causes her more problems. Jealous of her, the other girls increase their bullying, and it gets to a point where they threaten Touko’s life by hanging her out a window! But then something really odd happens. Jin steps in, claiming that Touko is about to die there. How exactly does he know this? The other girls were just being mean, and had no intention to actually kill Touko. But Jin knows what will happen. Why? He claims that he is actually from the 23rd century, and he is there to save her! How can anyone possibly believe that?! Then again, he did ask such a strange question when they first met. Is Jin really from the future? Would Touko really have died there, and why would he want to save her? Strange things seem to happen around Jin, he may possibly be telling the truth…. Thus begins the adventures of Touko and her bodyguard who may or may not be from the future!